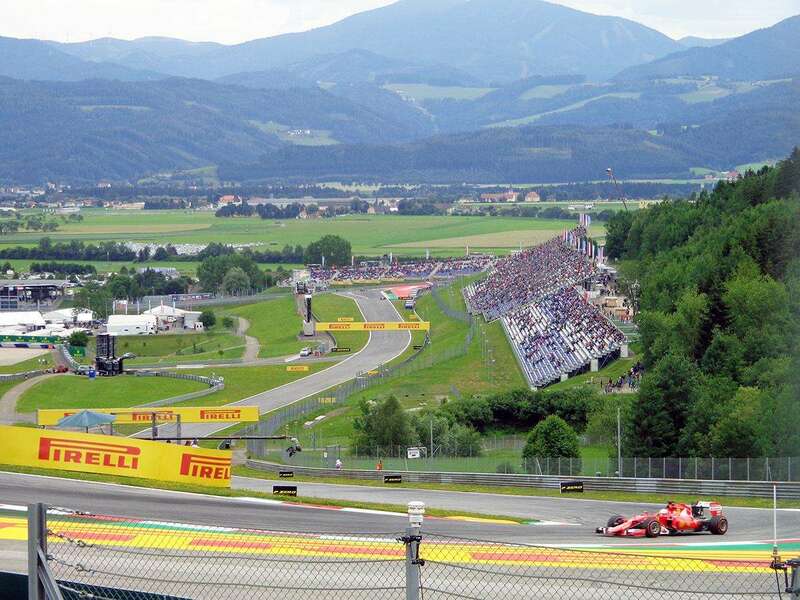 What tickets to buy and where to watch the action at the Red Bull Ring for the 2019 Formula 1 Grosser Preis Von Österreich in Spielberg on June 28-30. 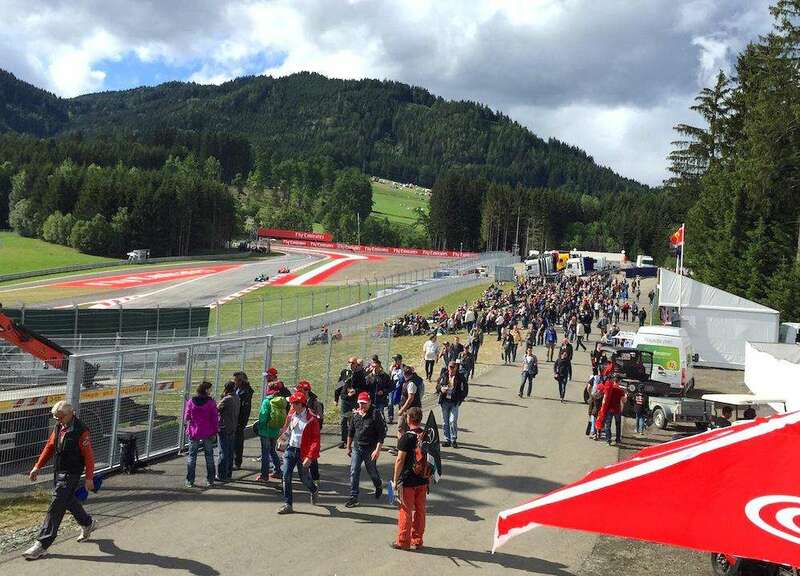 Attendance levels have been on the rise again at the Red Bull Ring, thanks in part to the thousands of Dutch fans who have started traveling to the event to support Max Verstappen. Their trip was worth it in 2018; the young Dutch driver took the win for the home team! 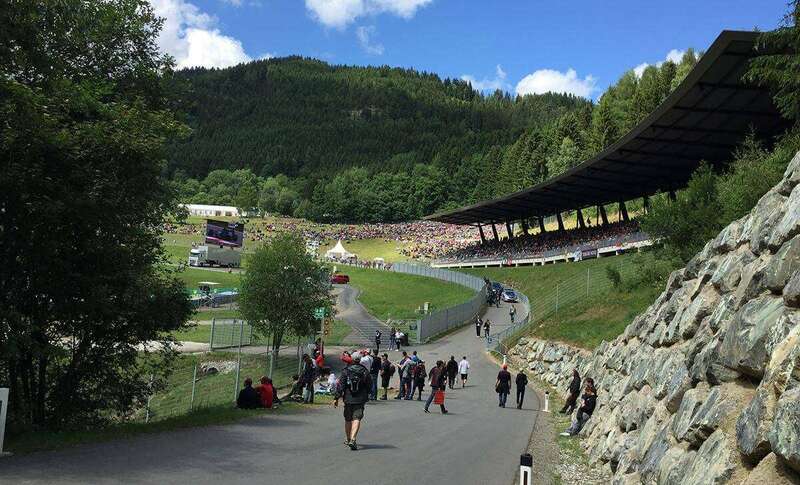 Nevertheless, the Austrian Grand Prix is not one of the highest attended races on the calendar, which can be seen as a positive; the roads into and out of the circuit are less congested and there are no queues for the toilets! Unlike other F1 venues, the choice of tickets at the Red Bull Ring is pretty straightforward. You can choose from just three grandstands, plus General Admission. Price remain pretty much unchanged from last year, ranging from under €100 for the excellent 3-day General Admission tickets, less than €200 for the cheapest Grandstand tickets and up to €395-495 for the best pit-straight seats and the South West grandstand. The organizers also offer “three-corner grandstand hopping,” which has proved very popular; these tickets are some of the first to sell out. Ticket prices have not been increased for 2019. Ticket prices are discounted by up to 20% until December 31, 2018. Support the ongoing development and improvement of our free Grand Prix travel guides by buying your F1 tickets from our partners, Gootickets. We receive a small commission when you buy using the links on this page. We don’t apply any markup, so you always pay the cheapest price! We also recommend Official Ticket Packages from F1 Experiences. FREE entry for children born in 2005 or after, but you must reserve these tickets, and children need to be accompanied by a parent/guardian with a valid ticket. If your child is born in 2004 or earlier, you will need to purchase a full-price ticket for them. All grandstands have numbered seats for all three days of the event (Friday to Sunday). There is no ‘Free Friday’ where you can sit in any grandstand. Tickets for Sunday only are also available at a small discount over the cost of 3-day tickets. There’s a wheelchair section in the Start-Finish Grandstand with 3-day tickets priced at €95 before discounts (same price applies to companion). Disabled fans get a 50% discount on all other tickets. All Grandstands and General Admission areas have access to big screen TVs. The main Start-Finish Grandstand and the Nord grandstands are covered, permanent structures. The other grandstands are temporary and uncovered. There is limited shelter in General Admission areas. F1 Experiences offers select grandstands and VIP hospitality in the Formula 1 Paddock Club™ at the Red Bull Ring, plus exclusive benefits such as a Drive the Track Tour, Exclusive Pit Lane Walk, opportunities to meet drivers and guided tours of the F1 Paddock. There are two categories of tickets in the large, permanent Start-Finish grandstand, which was built ahead of the return race in 2014. The more expensive seats in the middle of the grandstand with better views of the pits (sections D, E, F, G, H, I, J, K, L, M, N) are priced at €495 for 3 days, while the cheaper sections either side (A, B, C, O, P, Q) are priced at €395 for 3 days. Some higher seats give you panoramic views over the circuit. A good choice for pits action and the start/finish of the race. If you want to see more on-track action, choose Red Bull or Sud West. Click here for a video of the view from the Start-Finish grandstand. 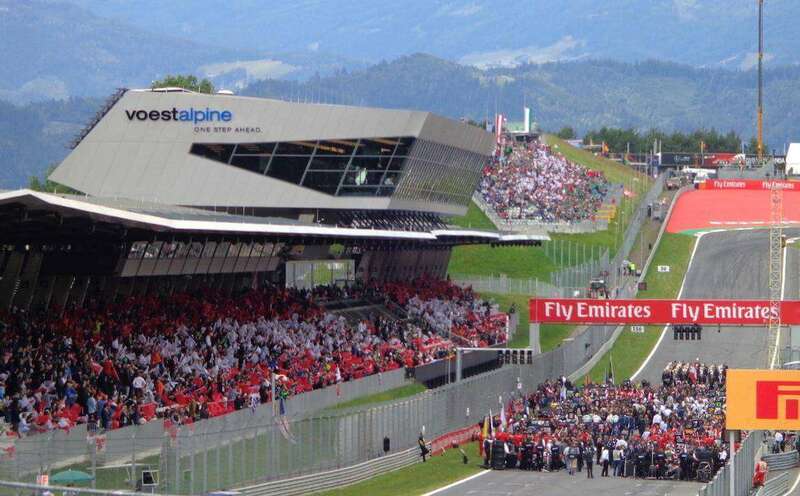 Tickets in this grandstand are the equal most expensive at the Red Bull Ring for good reason. If you are willing to spend €495 for 3 days (before discount), you’ll have an excellent view of the opening corner plus unrivaled panoramic views of the circuit over large sections of the circuit. The grandstand (like Red Bull) is also close to the Fan Zone, where all the best catering can be found, plus merchandise, concerts and the F1 Legends Parade display. On the downside, the grandstand is uncovered and open to the elements. The General Admission areas at the Red Bull Ring offer some excellent viewing opportunities. The areas on the hill at the top of the circuit provide panoramic views of large sections of the track, and there were multiple big screen TVs on which to follow the action (a rarity for General Admission). Be sure to check out the views from Turn 2, where you can see the cars up close at the top of the hill. There’s also good views on the outside of the entry to Turn 3. Closer to the start/finish straight, there is also excellent viewing on the entry to turn 8 (check our YouTube video) where you can really see the cars on the limit. The outside of the final corner (turn 9) is also a great place to watch the action. Grandstand Nord (North): Tickets are not being sold for the Nord grandstand in 2018 (nor were they sold in 2017). This is a covered, permanent grandstand at the top of the circuit, overlooking turn 3. Unfortunately, it’s set back quite a distance from the circuit and you don’t get to see much more than turn 3, unlike other grandstands which offer panoramic views, such as Sud West or Red Bull. It’s also a 30-40 minute walk from the main Fan Zone near turn 1. Mitte: this grandstand used to be situated in the middle of the circuit between turns 5 & 6, close to the big bull. The grass area here (close to the track but raised above the catch fencing) is a good place to practice your panning photography shots. Check out our YouTube video. Our verdict: The Red Bull Ring is an excellent F1 venue with top notch organization and a beautiful location in the Austrian countryside. Been to the Austrian Grand Prix? Leave a comment below and tell us your favorite place to watch the action. Can I go with the green ticket in the family section and yellow sector? Hi, I am not 100% sure, so I have asked my contacts at the circuit. If you have a green ticket (General Admission), you should be able to get into the Yellow zone no problem, but not the Blue zone. And I guess entrance to the family area will be restricted to those who have children. Can I purchase general admission tickets on site on sunday? Im travelling from mexico and Id love to attend, but Im not sure if Im gonna be able to make it on time. Hi Pablo, this should be fine as the race hasn’t been a sell out in recent years. But you should still try and buy ahead of time when your trip is confirmed! Can you still go into the yellow zone with a green ticket this year? Hi Eric, cannot confirm if you can get into all areas of the Yellow zone, but most should be open to Green (General Admission) ticket holders. This is also the main way to get to the F1 village area. What is the best way to get from Graz to the race without renting a car? We have tickets for all 3 days. Hi Tammy, there are trains and buses from Graz to the Red Bull Ring; the bus is a little quicker and more direct than the train. More information in Getting There & Around section of our guide. -> Tribune Nord is not open to use for general admission ticket holders or others, most probably not even the grassy section directly in front of the tribune (was open at Moto GP race…). It is not guaranteed whether there will be a TV screen at the Rauch corner,as tribune Nord is closed. This quite disappointing, it would be no cost to open tribune and TV screen has anyhow to be placed there for Moto GP race one month later. Thanks a lot Stefan for finding out this information. 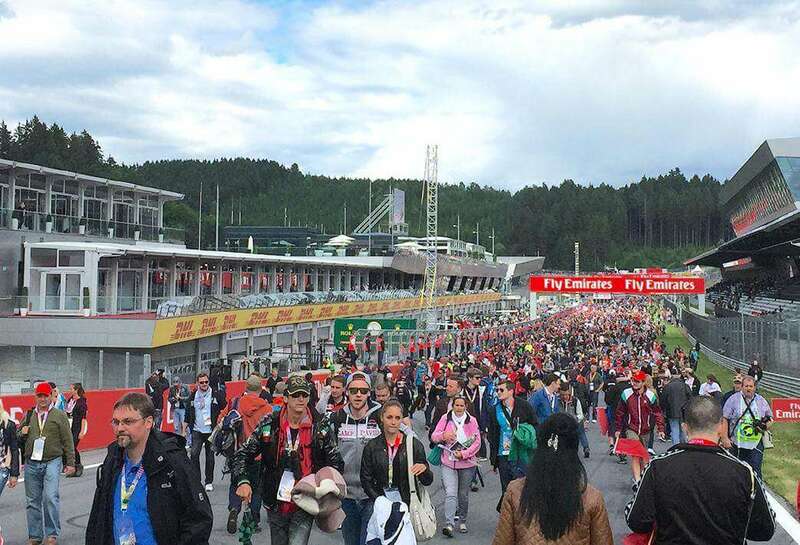 It is disappointing, but the reality is that the fans have not been supporting the event and attendances for F1 at the Red Bull Ring have been falling steadily. Hopefully the new owners can help turn this around soon! Low attendance is no excuse. Two security guys for grandstand nord cost 3days*12hours*20€ (securely estimated)=720€ that is no big expense when you have in mind what Red Bull is paying for the race (millions…). Even if my calculation is a bit clumsy, opening the grandstand nord would result in no more cost than some 1000 Euros. -> I think closing grandstand nord means cutting costs at a wrong uneffective spot and just leaves the track owners with disappointed visitors, who can not use this awesome spot to watch the race and instead have to accept the restricted views right next to it up the hill. And disappointed visitors will not come back. Hi Stefan, I totally agree. Let’s hope the organizers see your point and open the Nord Grandstand this year! The Red Bull grandstand is located in the so called Blue Zone, but you should be able to watch from the Yellow Zone (e.g final corner, Mitte) and Green Zone (general admission at the top of the circuit). Hello, i have one question, can you confirm GA ticket holeder can go on nord grandstand? Hi Ivan, we have been told that the Nord grandstand will not be open this year for the Grand Prix. Hi, we’re attending the race with a 11yr old & a 2 1/2 yr old. We have general admission tickets. Do we need noise blocking earmuffs for toddler. Hi Irene, F1 is not particularly loud these days, your toddler should be fine. But some of the support races will be loud (plus there will be Le Mans cars in action for the Legends Parade this year), so it’s still a good idea to take some along in case. Hi, I have tickets for Redbull GS L,M,N,O,P but this is not shown on the map (only goes from A to K)? is there any other action on the circuit before or after the race that is worth viewing? e.g. what would be a good time to arrive at the track? Hi Frank, are you sure your tickets are in the Red Bull grandstand? I think you may have tickets to the Start-Finish grandstand, as this has sections L,M,N,O,P. There’s lots of other on-track action, including Formula 2, GP3, Porsche Supercup and the Legends Parade. This year, the Legends Parade features some ex-F1 and endurance drivers behind the wheel of some awesome Le Mans cars. Check the Trackside section of our guide for the full schedule. Hi Can I buy 3 day ticket ( general admission) on Friday ?Can you confirm that with this 3 day ticket I can bring another person for Friday? Hi Igal, yes you can purchase a ticket at the gate on Friday (and you can bring another person on Friday if you purchase a 3-day ticket). There is a ticket office near the gate behind the Nord grandstand, close to the main general admission area and parking. Hi, can you conform that Red Bull stand tickets holder (Blue Zone) are allowed in the yellow and green zone’s? With kind regards. Hi Cedric, I don’t have 100% confirmation, but yes, I think you should be able to enter all zones. Enjoy the weekend! Thanks for the quick reply, will try during the various sessions tomorrow and leave feedback. Entering Green was no problem, will try Yellow this afternoon of tomorrow morning. I was in 2016 at Hockenheim and I was not sure where are the exits to the race track and until I have seen it it was allready too late a lon waiting line was formed and I was leaving. In 2011 I was in Budapest with a friend of mine and he was there before so half an hour before the race end we positioned near the exit. Hi, I am not sure there will be access on to the track from the main grandstand. Last time I went, they opened up the track at the both ends of the pit straight. If you want a good view for the podium, you should get to the entrance points around 20 minutes before the end of the race. I forgot to ask, 3 day ticket means on thursday I can get to walk on the pit lane and maybe meet drivers? Yes, you can also go on Thursday to the pitlane walk if you have a 3-day ticket. So it’s actually a 4-day ticket:) You will have the chance to get some autographs on Thursday, and possibly there will be another autograph session with the F1 drivers on another day. Great, thanks for the info Eric! Hi! Using the advice and information from you guides we have booked tickets for the Austrian F1 in 2018. We have decided to get tickets in the South-West stand, however I was wondering if you had any advice as to whether it was better to request seats higher or lower in this stand for the best views? Thanks. Hi, the higher the better in the South West grandstand at Red Bull Ring. Enjoy the race! We’re a family of 5 people who are buying tickets at the red bull grandstand. Does sector c have good insight to the action in turn 1? What support races will be held at Spielberg next year? Do we get admission to other areas such as the green area between turn 3 and 4? Sorry, the final schedule has not yet been released, so I don’t know exactly what time this will be on. Just to check, if I buy General Admission can i count on having a seat? or it is just big grass field? According article photos, it doesnt have tribune in General Admission tickets? Can someone share if i can buy tickets on spot on Saturday? I would go to Red Bull stand on Saturday only. I don’t think there is an extra fee for buying at the ticket office, but I’m not 100% sure. Which is the best view in row 1 for motogp? Which is the best view in higher seats, Mitte or T8-Grandstands? Sorry Francesco, I don’t know much about the grandstands for MotoGP at the Red Bull Ring. Hope you worked it out! Martin, you would need to contact GPTicketshop, the official sales agent for the Austrian GP. Hello, do you have any idea when will they sell tickets only for Friday or Saturday? And how much do these day tickets usually cost? I would like to go only for one day. Thank you for your answer. Hello, I don’t think so. Sorry! Only weekend tickets or Sunday tickets are available. The Red Bull Grandstand as well as the Start to Finish one Stand is all sold out. Considering the fact that its mentioned that the Austrian Grand Prix is not one of the highest attended races on the calendar,am wondering if at a later date they will release additional quantities of tickets for sale. Am bit confused as badly wanted to book in that sector. It is gettting more popular, especially with Dutch fans. But the circuit doesn’t have a lot of grandstand seats. If you want to go this year, I guess you need to choose a different zone. Lots of good views at the Red Bull Ring, even from General Admission areas. Sorry, this question is very detailed. You should contact the circuit for the answer.